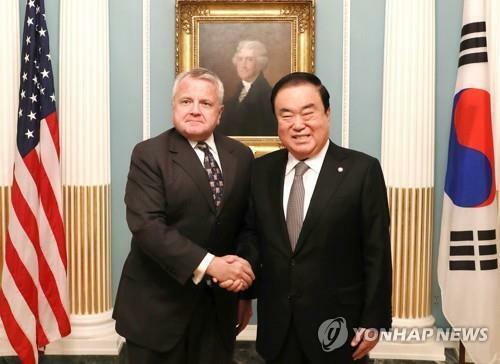 S. Korean parliamentary speaker talks about N. Korea in U.S.
WASHINGTON, Feb. 11 (Yonhap) -- South Korea's parliamentary speaker met with a top U.S. diplomat in Washington on Monday and reaffirmed the two sides' commitment to achieving the full denuclearization of North Korea, the State Department said. National Assembly Speaker Moon Hee-sang led a parliamentary delegation to the U.S. capital just weeks ahead of the Feb. 27-28 summit in Vietnam between U.S. President Donald Trump and North Korean leader Kim Jong-un. During their meeting, Moon and U.S. Deputy Secretary of State John Sullivan "reaffirmed the ironclad alliance between the United States and the Republic of Korea," the department said in a statement. They also "pledged to maintain close coordination to ensure the final, fully verified denuclearization" of North Korea, it added. The second Trump-Kim summit is aimed at fleshing out the two leaders' agreement during their first summit in Singapore in June last year, which included a commitment to work toward the complete denuclearization of the Korean Peninsula in exchange for security guarantees for Pyongyang. The department said Moon and Sullivan also "affirmed their mutual commitment to strengthening trilateral cooperation with Japan and to achieving our shared goals in the Indo-Pacific."